Briz'dra's long hair is mostly blue but a part of it is dyed red. She has a tendency to be blunt and abrasive. She wears blue clothes over her armor. 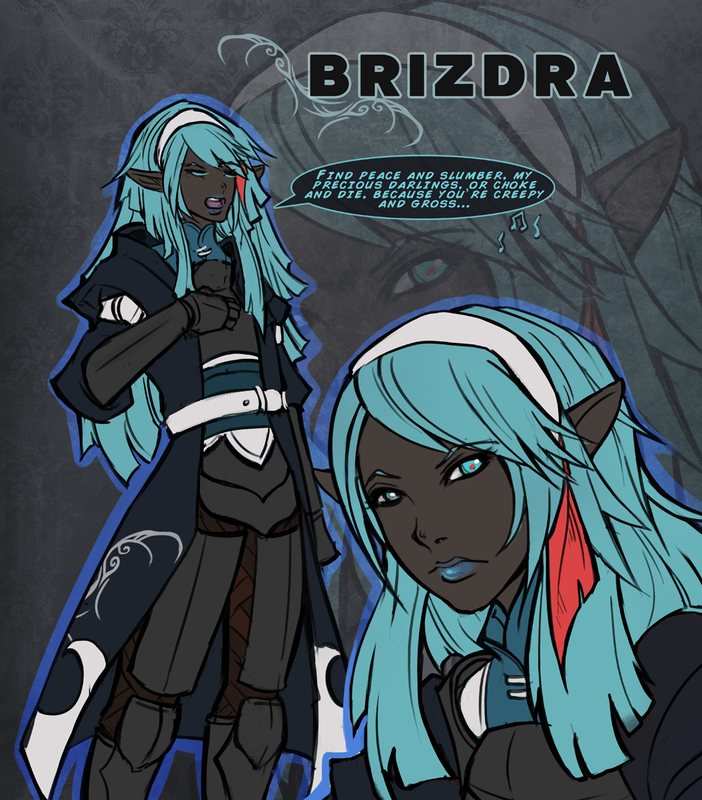 Brizdra met Wafay and responded to her inquiry by stating Suu'be wouldn’t waste more troops before being interrupted by Erelice. As Wafay explains her mother’s experiments, Brizdra questions how it is all related to the Nidraa'chal to which Wafay answers she’s seen her mother’s notes and her mother frequently gets visited by a tainted woman. When Jaal'darya golems make themselves known, Brizdra is shocked that Erelice conceded to their demands to have Wafay back but Filf'rae and Erelice calm her down by stating the mission continues as planned. The squad secures a couple of boats to cross the lake separating them from the Jaal'darya fortress. While crossing the lake, they are attacked by the Jaal’s golems. The squad fights back. Brizdra uses her spellsinging to drive them away. The squad successfully crosses the lake where they are greeted by the Jaal'darya clan members. The Jaals ask the Sarghress squad to explain themselves. After Erelice talks to the Jaals the Jaals decide to let them stay as they arrange an audience with Asira'malika. Brizdra is impressed with the Jaal fortress and compares it to the fortress in Val'Raveran. Several hours later, the squad is still waiting for somebody to see them. After Sabryne sees a golem with a message attached, she whispers in Brizdra’s ears and Brizdra uses a spellsong to put everyone to sleep. She then helps her squadmates wake up. Brizdra tells Erelice that they have a lead and Sabryne has a map courtesy of Wafay. The squad then follow the map. They reach a room and Erelice tells Vayas'arn and Brizdra to stand guard while Filf'rae and Sabryne goes in with her. Unfortunately, the Jaals catch them. Later, during a hearing with a council of Jaal representatives, the Jaal'darya demand that the squad explains their actions. Erelice explains Wafay’s concerns about a Nidraa'chal conspiracy within the clan and the squad has found that Femi has indeed created a flower similar to what Wafay describe. This troubles the Jaals who admit that while Femi has the right to develop such a weapon, they have had traitors before. They then allow the Sarghress to leave. Filf'rae and Brizdra asks Erelice why she didn’t mention the map or the encoded journal. She answers that the Jaals would figure it out anyway and they might never have let them leave. The squad leaves Jaal territory and proceed to report back to Quain. Image:Concept_(CHARNAME).jpg|Official concept art of (CHARNAME). 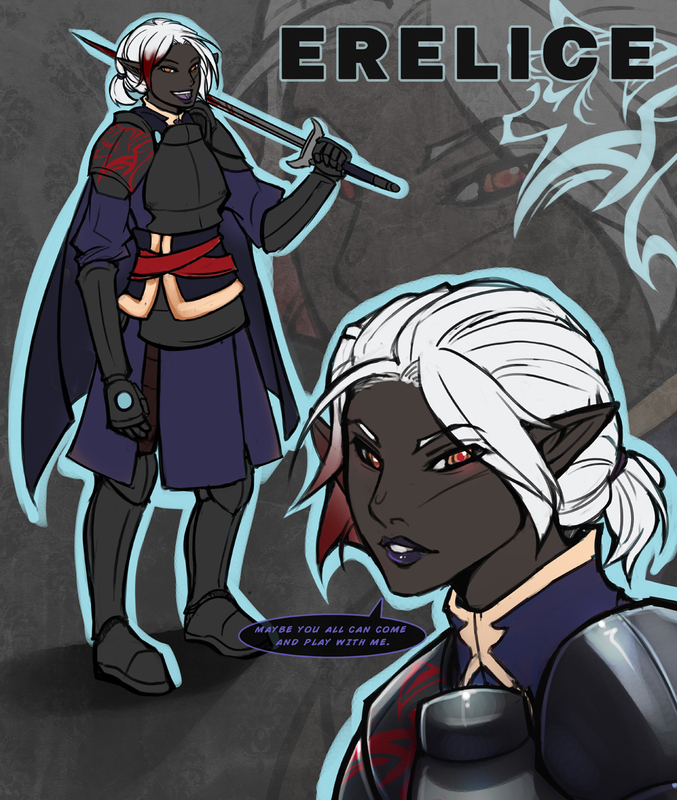 Erelice's mostly white hair is tied into a short ponytail and is partly dyed red. In addition to her armor, she also wears blue clothes and a cape. Erelice and Filf'rae first meet Wafay by saving her from the Sarghress clan members who were harassing her and takes her to meet the squad. When Brizdra comments that Suu’be wouldn’t waste troops on the mission, Erelice interrupts her and tactfully states that they couldn’t spare more troops due to the war effort. On the way to Wafay’s home, Erelice explains that the squad is equipped to deal with a range of scenarios but does ask for and receive more information on the flower. When Jaal'darya golems make themselves known, Erelice concedes to their demands to have Wafay back but after they left, she tells her squadmates the mission continues as planned. The squad secures a couple of boats with Erelice’s haggling skills to cross the lake separating them from the Jaal'darya fortress. While crossing the lake, they are attacked by the Jaal’s golems. Erelice tells Brizdra and Vayas'arn to drive them the golems back. The squad successfully crosses the lake where they are greeted by the Jaal'darya clan members. The Jaals ask the Sarghress squad to explain themselves. Erelice, who is surprised to see a male member of the Jaal'darya but keeps it to herself answers that Wafay invited them. Erelice explains that they have information that may be worthy of the Jaal Ill'haress' ears and would like to speak with the ambassador the Jaals have for the Sarghress, if not Asira herself. The Jaals decide to let them stay as they arrange an audience with Asira'malika. Erelice tells Filf'rae the Jaals fortress isn’t quite what she expected to which Filf'rae answers no one could have upon seeing what life within the Jaal'darya clan is really like. Several hours later, the squad is still waiting for somebody to see them. Brizdra, upon Sabryne’s message, uses a spellsong to put everyone to sleep then helps her squadmates wake up. Brizdra tells Erelice that they have a lead and Sabryne has a map courtesy of Wafay. The squad then follow the map. They reach a room and Erelice tells Vayas'arn and Brizdra to stand guard while Filf'rae and Sabryne goes in with her. They are shocked by what they see. The flowers causing two bodies to rot inside out and a map apparently showing the flowers have been sent to various locations. A golem attacks them but the three defeat it. Unfortunately, the Jaals catch them. Later, during a hearing with a council of Jaal representatives, the Jaal'darya demand that the squad explains their actions. Erelice took the lead and explains Wafay’s concerns about a Nidraa'chal conspiracy within the clan and the squad has found that Femi has indeed created a flower similar to what Wafay describe. This troubles the Jaals who admit that while Femi has the right to develop such a weapon, they have had traitors before. They then allow the Sarghress to leave. "''What… is this? It looks like the bodies rotted from the inside out.''" Seeing the effect of the flowers. 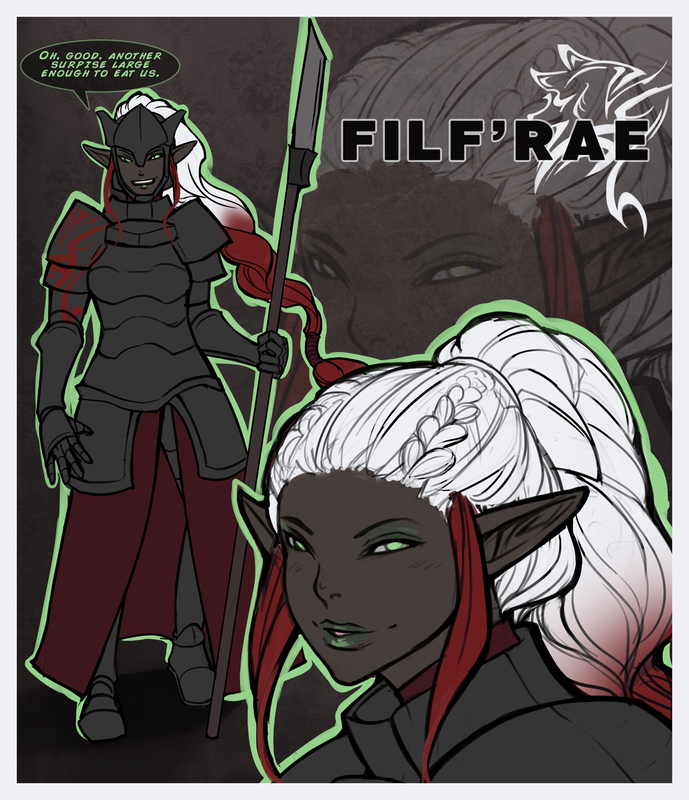 Filf'rae's white hair has been largely dyed red and tied into a long ponytail. She wears red clothes under her armor. Erelice and Filf'rae first meet Wafay by saving her from the Sarghress clan members who were harassing her and takes her to meet the squad. As Wafay tries to recall the details of her mother’s research, Filf'rae and Vasar'arn give her encouragement. When Jaal'darya golems make themselves known, Filf'rae calms Brizdra down, telling her they can’t take on the golems. The squad secures a couple of boats to cross the lake separating them from the Jaal'darya fortress. While crossing the lake, they are attacked by the Jaal’s golems. Filf'rae tells Erelice upon hearing Brizdra’s spellsinging that the intent is more important that the lyrics. The squad fights back and successfully crosses the lake where they are greeted by the Jaal'darya clan members. The Jaals ask the Sarghress squad to explain themselves. After Erelice talks to the Jaals, the Jaals decide to let them stay as they arrange an audience with Asira'malika. She tells Erelice that no one could have expected what the Jaal’daryas were really like on the inside away from outside eyes. Several hours later, the squad is still waiting for somebody to see them. Brizdra uses a spellsong to put everyone to sleep upon Sabryne’s message and then helps her squadmates wake up. Brizdra tells Erelice that they have a lead and Sabryne has a map courtesy of Wafay. The squad then follow the map. They reach a room and Erelice tells Vayas'arn and Brizdra to stand guard while Filf'rae and Sabryne goes in with her. They are shocked by what they see. The flowers causing two bodies to rot inside out and a map apparently showing the flowers have been sent to various locations. A golem attacks them but the three defeat it. Unfortunately, the Jaals catch them. "''I don’t think anyone could have expected this.''" Seeing what life is like within the Jaal'darya clan. 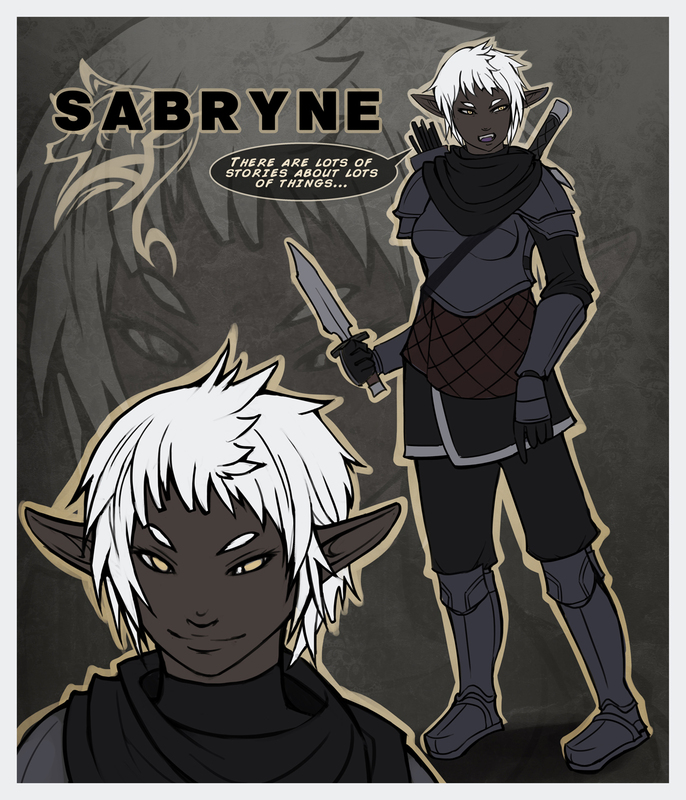 Sabryne has short white hair and dark coloured clothes as befits a member of the Fallen Legion. When Sabryne met Wafay, she responded to her comment about stories about the Fallen Legion by stating that there are lots of stories about lots of things. On the way to Wafay’s home, Sabryne follows the group in silence. When Jaal'darya golems make themselves known, she remains alert the whole time. The squad secures a couple of boats to cross the lake separating them from the Jaal'darya fortress. While crossing the lake, they are attacked by the Jaal’s golems. The squad fights back and successfully crosses the lake where they are greeted by the Jaal'darya clan members. The Jaals ask the Sarghress squad to explain themselves. After Erelice talks to the Jaals, the Jaals decide to let them stay as they arrange an audience with Asira'malika. Several hours later, the squad is still waiting for somebody to see them. Suddenly, Sabryne notices a small golem with a message attached. She whispers in Brizdra’s ears and Brizdra uses a spellsong to put everyone to sleep. She then helps her squadmates wake up. Brizdra tells Erelice that they have a lead and Sabryne has a map courtesy of Wafay. The squad then follow the map. They reach a room and Erelice tells Vayas'arn and Brizdra to stand guard while Filf'rae and Sabryne goes in with her. They are shocked by what they see. The flowers causing two bodies to rot inside out and a map apparently showing the flowers have been sent to various locations. A golem attacks them but the three defeat it. Unfortunately, the Jaals catch them. Vayas'arn is concerned that the Nidraa'chal are still around and worries there might be another war but Sabryne reassures her saying that they are already at war, the stakes simply got higher. The squad leaves Jaal territory and proceed to report back to Quain. "''We are already in a war, Vayas. The stakes simply got higher, that’s all.''" Reassuring Vayas'arn. 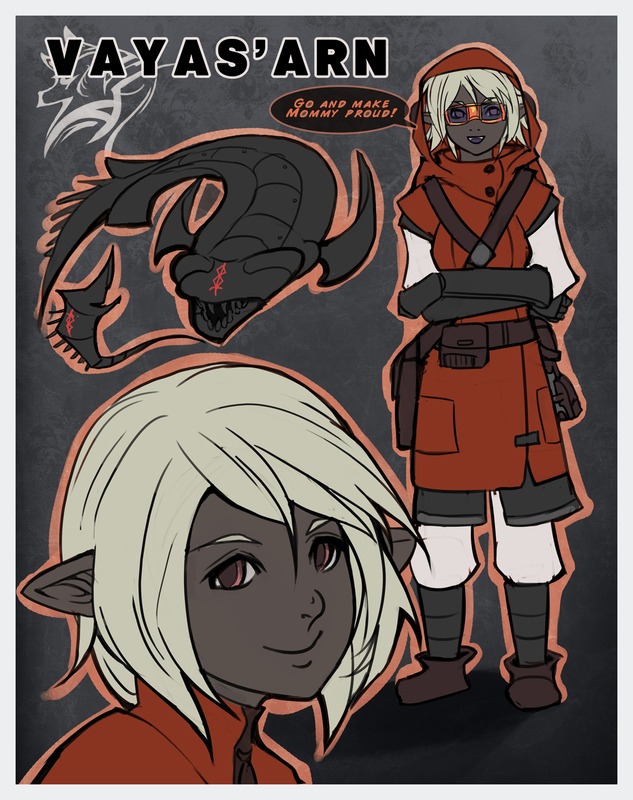 Vayas'arn has short white hair and wears red clothes. She also carries her tools and equipment on her person. When Vayas'arn met Wafay, she complimented Wafay’s golem Sata. The squad secures a couple of boats to cross the lake separating them from the Jaal'darya fortress. While crossing the lake, they see the Jaal’s golems which Vayas'arn thinks are cute before they were attacked by them. She releases her own golems upon Erelice’s order. They successfully crosses the lake where they are greeted by the Jaal'darya clan members. The Jaals ask the Sarghress squad to explain themselves. After Erelice talks to the Jaals, the Jaals decide to let them stay as they arrange an audience with Asira'malika. Vayas’arn is surprised to see male members of the Jaals though unlike Erelice comments on this loudly to the amusement of the Jaal'darya. She is also impressed by the fortress. Several hours later, the squad is still waiting for somebody to see them. Vayas'arn notes that they’re like prisoners since they can’t leave the room. Brizdra uses a spellsong to put everyone to sleep upon Sabryne’s message and then helps her squadmates wake up. Brizdra tells Erelice that they have a lead and Sabryne has a map courtesy of Wafay. The squad then follow the map. They reach a room and Erelice tells Vayas'arn and Brizdra to stand guard while Filf'rae and Sabryne goes in with her. Unfortunately, the Jaals catch them. Location: Do you really care?